The Explorer view displays a collection of thumbnail maps. When World Builder first starts, this view will be empty, but the Random series settings will be defaulted to generate a collection of thumbnails when the Start button in the Explorer toolbar is clicked. 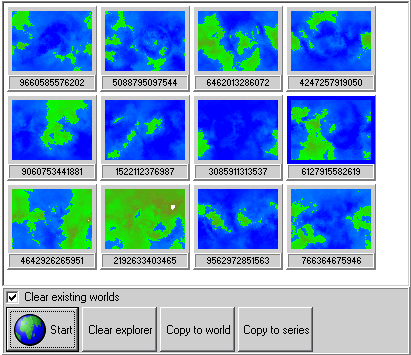 Each thumbnail displays both a map and the seed value that was used to create the map. The thumbnails can be clicked on to select them, at which point the Copy to World and Copy to Series buttons become active.